Upon receiving the featured photo in an e-mail, I could not help myself from having a very strong reaction, one of outrage. However, after giving the matter some thought, I came to the conclusion that it was highly conceivable for individuals from varied backgrounds to have very different and very unique reactions to this picture. Elitist white people could simply laugh and see the obvious fact that Michael Brown was far from a saint and that he had no one but himself to blame for what occurred. Had he stayed out of trouble, e.g. not robbing cigarettes from a local convenience store and whatever other misdemeanors he had committed in the past, he would never have arrived at a confrontation with a police officer, ultimately resulting in his demise. More fair-minded citizens, regardless of race or ethnic heritage, might view it as a terrible tragedy, that an individual of any race committing such a minor crime should suffer such a dire fate. They might view the police officer as overly aggressive, exacerbating the situation and elevating it to an inevitable fatality. However, they might also consider that had Michael Brown not been involved in a criminal act, this whole situation may have never occurred. Finally, Al Sharpton followers, e.g. particularly blacks with major chips on their shoulders, would only see the policeman as the perpetrator of evil. They would view Michael Brown as a poor black kid, one who never had opportunities in life, one who had been forced to resort to stealing for survival, and that his fate was a direct result of a community where racism permeated every black citizen’s existence. The events in Ferguson, Missouri over the past few months have been extremely troubling and have created a major stir around the country. Combining these events with the case of Eric Garner in NYC, race relations may be at an all time low since the era of Martin Luther King. The question that we need to ask ourselves is: would Office Darren Wilson have shot a 6’8”, 250 lb White male coming toward his car? And the answer is “we will never know the answer to that question”! One thing is perfectly clear; the last thing that anyone in this country needs is the Al Sharptons of the world encouraging rioting and looting by screaming the word “racism” every time there is an incident between a white police officer and a black citizen. There is no denying the existence of racism and other prejudices in our society. Vestiges of the Ku Klux Klan still exist in today’s society. Schools still exist which are predominantly filled with black students, while other schools are predominantly white, some by choice, others by default. This is not going to change anytime soon, but at least it is out in the open and we can work toward a future with better race relations. Anti-Semitism still exists around the world. Recent incidents in France accentuate that fact, almost seventy years after the Nazi empire was defeated. Human beings are flawed and all the laws and oratory preaching that bias by race, religion, ethnicity, or gender is wrong is not going to ever change that fact. That reality, coupled with the fact that certain parents pass their biases down generation to generation, truly believing that they are in the right, perpetuates this atrocity. Ignorance is truly bliss for these individuals. The glass ceiling still exists for women in many major corporations. Yes, there has been progress. However, numerous women in the workplace have equal positions and work just as hard, if not harder, than their male counterparts and do not earn equivalent salaries and are not promoted on an equal basis. We can only aspire to a future where this ceiling will be shattered, never to be rebuilt. l things being equal, let’s deal with the issue at hand, i.e. Michael Brown being shot by a police officer in Ferguson, Missouri and the black population in Ferguson believing the shooting was racially motivated. On a simplistic basis, we ask the question: “Did Michael Brown deserve to die?” Obviously, he did not; at 18 years old, he had his whole future ahead of him. And who is to say that he could not have turned his life around and had a very bright future, with success and happiness? But that is not what happened. A young life was snuffed out in a heartbeat, in a moment of anger and panic that will haunt the town of Ferguson for many years to come. But whether we like it or not, we have to consider that this young man had been in trouble before, so it should not be so shocking that he chose to confront a police officer rather than walk away. (1) Police officers may fire their guns very few times in an entire career. All police officers are not necessarily expert marksmen. Under duress, in a crisis situation, it would be logical to shoot at the largest target, which would be the chest. (2) In confrontational situations, a split second decision must be made. A bad decision could create a situation where the officer’s life might be in imminent danger. Additionally, there is never a guarantee that the individual charging the police officer does not have a weapon of some sort. (3) Even the best trained officers may panic in a situation where they feel threatened. 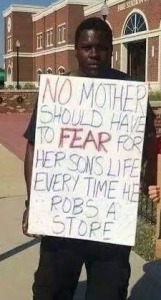 The problems in Ferguson, Missouri go far deeper than Michael Brown. The first problem that exists is a population in that community that is 67.4% black and a police force that is 94% white. What does that tell you about the dysfunctionality of that community? Let’s reduce this to “Mathematics”. In the 2010 census, 29.3% were White and 67.4% were African American. www.wikipedia.com. If the police force is 94% white and the black population is 67.4%, then the probability of a white police officer shooting a black citizen in a confrontation would be approximately 63%. Now let’s add ancillary factors affecting the probability. If the black population is less affluent than the white community and therefore more prone to commit criminal acts by an estimated 30%, then the probably of this confrontation would increase substantially. It may also be inferred that race relations in Ferguson are tense at the very least, so let’s assume that the odds of a confrontation again increase. Extrapolation, using these figures, increases the odds of this confrontation to approach 78%. The truth is that a black man in Ferguson, Missouri, was eventually going to be shot by a white police officer. The question was not “if”, but rather “when”. And Michael Brown was the unfortunate victim that the laws of probability selected! So what conclusions can we draw from the events in Ferguson, Mo.? The public approach, spurred on by a reckless media, was destined to blow an unfortunate event into a national tragedy. This situation inevitably had to escalate to a point of no return. What actually happened is no longer relevant; the only thing that matters is the convenient assessment of the events, i.e. this must have been a racist incident. And that biased conclusion is truly unfortunate on so many levels for the citizens of the United States. There will be no winners here. The citizens of Ferguson, Missouri and the Sharptonites around the country will believe that the prosecutor swayed the grand jury and that the decision was unjust, regardless of the facts and/or the testimony presented. Since we will never really know what happened in the grand jury room, we have not the right to make the assumption of prejudice. But with the help of mass media, and a presidential agenda, that is exactly what occurred. Although speaking to the contrary, President Obama and Attorney General Eric Holder basically gave a license to the angry citizens of Ferguson to riot and loot. We are at a critical juncture in the history of this country regarding the relationship of our citizens and local police forces. If we don’t repair the fissure that has been created by these unfortunate events, the ramifications may be devastating. Every time an interracial police arrest/shooting occurs, and an unpopular grand jury decision is handed down, citizens should not be motivated to protest by blocking traffic and disrupting businesses, in essence injuring other innocent parties. We should not be insisting that a Federal Court file civil rights charges against the police officer, in essence, double jeopardy. The attitude should not be “if we can’t convict him one way, we’ll find another”. We should not be setting the ominous precedent of assuming that every time a white police officer shoots a black person, particularly one with a criminal history, that racism is the underlying reason. The events in Ferguson, Missouri have put this country on a path of self-destruction that will undo the progress of the last fifty years. I would hope that if Martin Luther King were alive today that he would caution the public against this type of radical behavior and look for a more judicious method of reconciliation. Unfortunately, he is not here and there does not appear to be a black leader today that can represent the black community with such dignity and intelligence. And that unfortunately is a major part of the problem that we face. Selma, Alabama is a hole in the wall city in America, a blot on the map, population listed in 2010 census of $ 20,756. Yet as much as any major city in American, Selma changed history. Selma, Alabama maintained such typical segregated facilities into the 1960s, which had been adapted to new institutions, such as movie theaters. Blacks who attempted to eat at “white-only” lunch counters or sit in the downstairs “white” section of the movie theater were beaten and arrested. More than half of the city’s residents were black but because of the restrictive electoral laws and practices, only one percent were registered to vote. This prevented them from serving on juries or taking local office. U.S. Civil Rights Commission report, 1961 Blacks were prevented from registering to vote by the literacy test, administered in a subjective way; economic retaliation organized by the White Citizens’ Council, Ku Klux Klan violence, and police repression. For instance, to discourage voter registration, the registration board opened doors for registration only two days a month, arrived late, and took long lunches. In 2014, the Michael Brown incident in Ferguson, Missouri and the events following may be to 2014 what Selma, Alabama was to 1965. This moment in time may represent a turning point for blacks and whites in America, a harbinger of the future of interracial relations in the ensuing years. It is a sad commentary on the state of affairs in the United States and the dearth of true leadership at the top. Having a black president was supposed to have been a major step forward, moving us into a new age of understanding between races. Instead we have regressed, returning us to the “Dark Ages” of American history. Today is the third day of a New Year, 2015. Let us hope that somehow Americans can get past Ferguson, Missouri and not continue to repeat the mistakes of the past. Let us move into the next decade with renewed hope, understanding, and clarity. If there is ever going to be global peace, let us first start at home. The United States needs to be a role model, not a bad example. I choose to quote Sidney Poitier in a film that exemplifies hope: “Lilies of the Field”: “AMEN”!